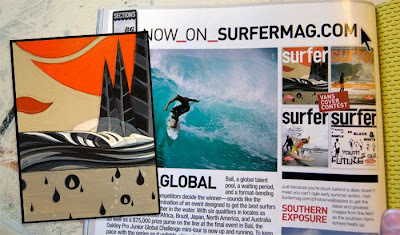 Sometimes you just submit something for the hell of submitting something and sometimes it pays off, in this case, the recent Vans Cover Contest where people can upload a picture or graphic and customize a fake cover for Surfer Magazine. I was just putzing around checking out the contest website and looking at everyones covers and decided to take about 15 seconds and pop in one of my recent paintings, never thought about it again… next thing I know my cover gets a little shot in the mag and an email asking for my address so Vans can send me a free backpack, pair of sandals and a shirt, as well as entering me for a chance at winning cash and the grand prize. Sweeet!